May has been busy, busy, busy. May is always one of the busiest months of the year in Stephanie’s Kitchen Garden and this year has been no exception. In fact, it feels as though we have been busier than usual; carrying out all of the normal spring jobs as well as catching up with the delays caused by the late, cold spring. 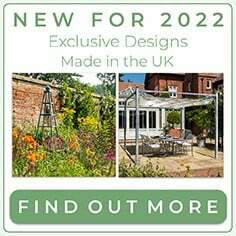 Added to the mix is our annual trip to the Chelsea Flower Show. Whilst May is one of my favourite times in the garden year, it always disappears in a flash and I know that the pace will settle down as we move into June. 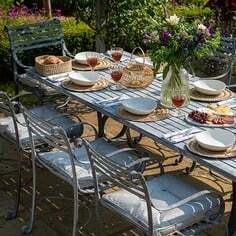 For most of May we have been enjoying some lovely hot and sunny weather, punctuated by an occasional heavy downpour. 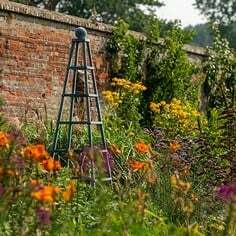 Gardens and gardeners have been revelling in the warm temperatures. The blinds have been pulled down on the greenhouse roof for most of the month and we are regularly damping down the floors to keep the conditions conformable for our plants. The tomatoes, aubergines, peppers and chillies have now been potted up and are enjoying the deeper root run. We have added capillary matting to the staging where these plants are to spend the rest of their season. This will help keep the humidity levels up and also to cool the greenhouse down on hot days. 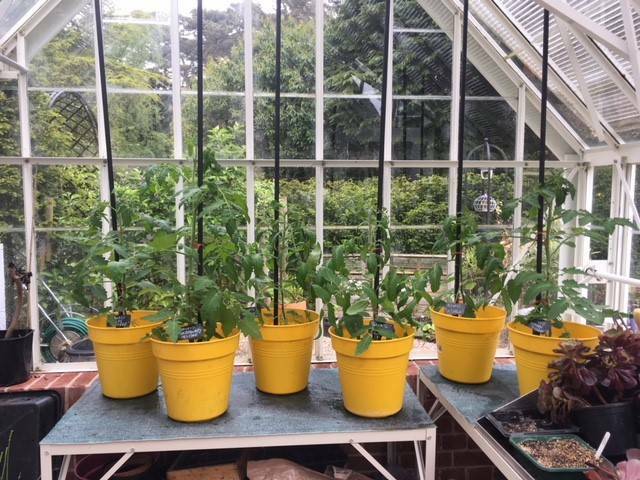 The first flowers have appeared on the tomatoes and chillies which indicates that it is time to begin feeding them with a liquid tomato food on a weekly basis, along with the peppers and cucumbers growing alongside them. As the month draws to a close, we have just finished planting out most of our summer crops. Our courgettes have been planted in full sunshine in one of our metal raised beds, with an empty plant pot sunk into the earth beside each plant for easy watering and feeding throughout the growing season. They already have some flower buds so we will start feeding them with a liquid seaweed and continue this weekly. We have grown three different varieties of squash this year; Butternut, Jaspee du Vendee and Cream of the Crop. 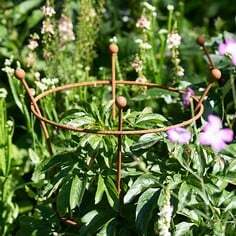 These have now been planted in different spots around the Kitchen Garden and will be trained to grow up obelisks. Growing them as a climber not only gives an amazing visual, it also keeps the fruits off the ground preventing rot. As with the courgettes, they will have a sunken pot at their roots and enjoy the same feeding regime. Our beans, runners and climbing French, have been planted at the base of their supports. 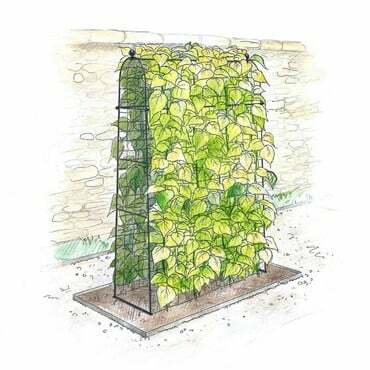 As with our peas, we have to add a low chicken wire fence around the plants when they are first planted out, to avoid them being eaten. Once they are well established, this can be removed. They are already beginning to twine around the netting. The remaining summer crops to be planted are sweetcorn and sweet potatoes. The sweetcorn has been slow to get going and is currently still in the cold frame to increase in size before being planted in the garden. Our sweet potato slips arrived in the post a couple of weeks ago. They look a little sorry when the first arrive so they spent their first week soaking their roots in water to recover from the journey. Once they perked up they were planted into pots to grow on in the greenhouse. In early June they will be planted out. Their arrival is always met with great anticipation as it is my most favourite of the kitchen garden crops. Around the middle of May, we revealed our precious peach, nectarine and apricot trees to the outside world. They have spent the winter under the protection of our fruit tree covers, which can now be removed. 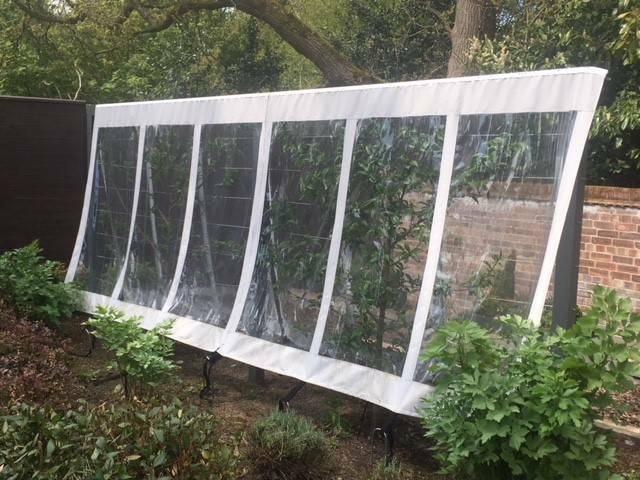 The covers help to prevent silver leaf disease and leaf curl and also create a microclimate for the trees. They have already flowered and are beginning to set plenty of fruit. The cold spring meant that bees were few and far between when the trees were in flower, so we artificially pollinated the flowers using a soft paintbrush. Last year we had an amazing first crop from these trees and are hoping for the same again this year. There is nothing as delicious as a warm, ripe peach fresh from the tree. Our raspberry canes are displaying promising flower buds which means it is time to put up our raspberry beetle lures. We have had signs of them over the past 2 growing seasons so want to make sure and catch them before they do any damage. At the first sign of catching a significant number of beetles, we will spray the crop with an organic insect killer spray. Most of our plant feeds are administered weekly and we have a designated day of the week when we do this to make sure we don’t forget. Other feeds, such as fish, blood and bone or treatments like nemaslug are applied on a six weekly basis, so it’s a good idea to have a calendar or diary to make sure you know when the next one is due. 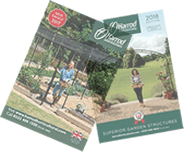 This also helps with successional sowings of crops like salads to write down the dates that seed batches were sown and when to sow the next one. It is really useful during busy times, to have a record to refer to. Despite the occasional heavy downpour, most of the month has been hot and dry which means that we have been out with the watering can in the early mornings to water our pots and newly planted crops. More established crops, such as our brassicas, peas, garlic and onions, are given a thorough soaking once a week. 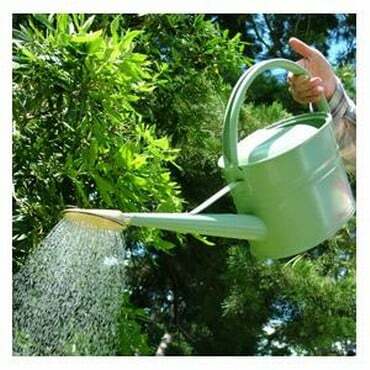 Whilst watering we inspect that plants for any early signs of pests and d iseases. So far, other than the occasional white butterfly, there are no signs of any around the garden, but we will continue to keep a close eye out so that we can control any attacks in the early stages before any significant damage is done. And of course, we have been harvesting this month. We are still picking huge amounts of rhubarb, spinach and salads. We have had our first asparagus spears and sprouting broccoli of the season. The first strawberries, from plants that were given cloche protection through the cold spring, are almost ready to be picked. The first fruit of the season, eaten straight from the plant, is always to treat to be savoured. Elsewhere in the garden, our wisteria plants have treated us to an amazing display, one of the best years we can remember. The sight of it is enough to stop you in your tracks and I have regularly been found with my face buried in the flowers drinking in their perfume. Along with the heady scent of apple blossom and azaleas and the sight of beautiful rhododendron flowers we have really been spoiled. As I write this the peonies are covered in fat buds promising a beautiful display to come. 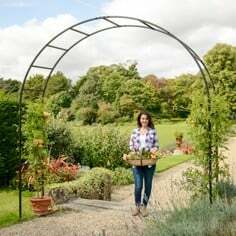 Amongst all the hustle and bustle of the garden jobs at this time of year, it is important to make time to simply stand and enjoy the spring display that nature is providing. It is your hard work that produces these, so make sure you enjoy the fruits of your labour! 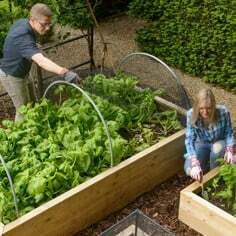 Continue making successional sowings of salads, carrots, peas and spinach. Hoe off weeds regularly to stop them taking hold. 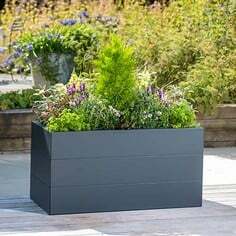 Water pots and beds during dry spells. Feed greenhouse crops weekly with a liquid tomato feed. 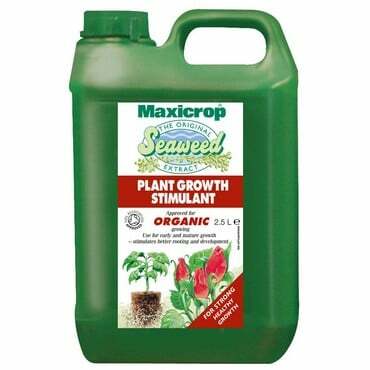 Feed beans, squash, courgettes and sweetcorn weekly with liquid seaweed. Feed brassicas every 6 weeks with fish, blood and bone. Plant our sweet potatoes and sweetcorn.